Side pull caliper brakes are just about the worst, performance wise, that you can have on a bike. Apart from expensive quality calipers found on good road bikes, they are found on many mass produced bikes since they are inexpensive to manufacture. Stopping with these brakes will eventually happen but it could be a lot better. If you have steel rims, it's even worst in wet conditions. 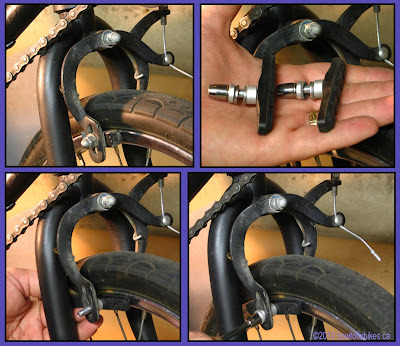 Short of having brake bosses welded to your frame for V-type calipers or a disc brake set-up, your options are limited. It could be cheaper to replace the entire bike. But if you want to keep your current bike, you have another option. 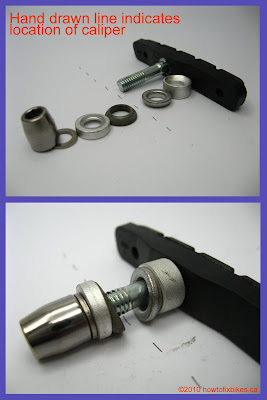 You can purchase inexpensive brake pads for V-type brake calipers for around $10 and install them on your existing calipers. The extra surface on the pads will give you more grip and help you stop a bit faster, simple physics. If you decide to spend more money on better pads, then do so. The better pads do work better, I highly recommend Koolstop for having used them often with great results. If you have steel rims, I urge you to replace them with alloy ones to get better braking power in wet condition, unless you live in the desert then kindly disregard my last comment. I stumbled upon what you're talking about quite accidentally, when I first starting rebuilding bikes about two years ago. The local bike shop was out of all brakes but Jagwire mountain bike pads, so I got those. The stopping power difference was amazing! I absolutely love that variety of brake, and I've personally found the braking power to be comparable to V-style, especially when used with bigger pads. The nice thing is, though, that centre-pull style can be installed on a bike which presently uses side-pull. Thanks for that info Frugal, I will definitely try it out. These are all the very best and all the frugal tips and techniques to how to save your bucks and how to fix it alone with all the simple tricks and very easily. Hey this is a great idea! I just put it on my ride, thanks!